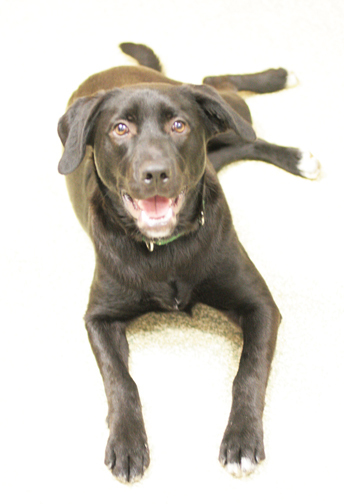 Posted on Wed, Mar 7, 2012 : 5:32 a.m.
Moe is a 1-and-1/2-year-old black Labrador Retriever mix with the cutest white toes who is currently available for adoption at the Humane Society of Huron Valley. He’s not only adorable but also well trained. Moe recently returned from his 6-week training course in the MI-Paws program, where he worked one on one with a handler from the Huron Valley Women's Correctional Facility. He did great in his course work and is now able to follow commands like sit, stay, down, shake and even "sit pretty." Moe is an easy-going dog who likes to be with people and other dogs too. He walks nicely on his leash, likes to go for car rides, and we think he’ll make a great family pet. He's an active dog who will need daily exercise and playtime. Come and meet Moe today — he is ready to go home with you now! Thu, Mar 8, 2012 : 11:17 p.m.
A suggestion more than a comment. I think you should go back to the free adoption day like you had before when Fridays was adopt a cat or dog free. More people were willing to adopt.